The Meis Student Development Center assists in the coordination of Scott College of Business professional development initiatives. The Center both initiates activities and supports the activities proposed by faculty, by student organizations, classes, or other members of the ISU campus community. 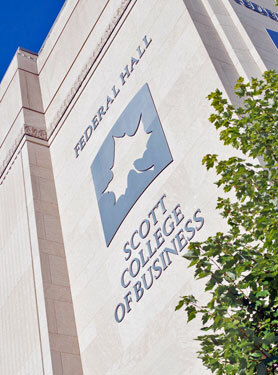 MSDC will serve all students in the Scott College of Business, coordinating with existing programs, including Networks programs and initiatives, to prepare ISU Scott College of Business students for careers in various business professions. As a supplement to their academic preparation, the Meis Student Development Center provides Scott College of Business students with tools to achieve professional excellence. This Center works with the University’s Career Center. The Student Development Center is located on the first floor of the Scott College of Business. The Student Development Center is open Monday through Thursday and is staffed by professional, graduate, and peer assistants. Additionally, the Student Development Center maintains a number of resource materials, including databases of Indiana and Illinois employers, for students’ use in searching for internships and career opportunities. How has the Meis Student Development Center helped you? Why should students use the Meis Student Development Center?